So for the last few days we haven’t really done much. Mom still has the lingering cough from her cold and I am finally done with mine. With the storms that have been coming through it has been to wet for much of anything to be done outside. 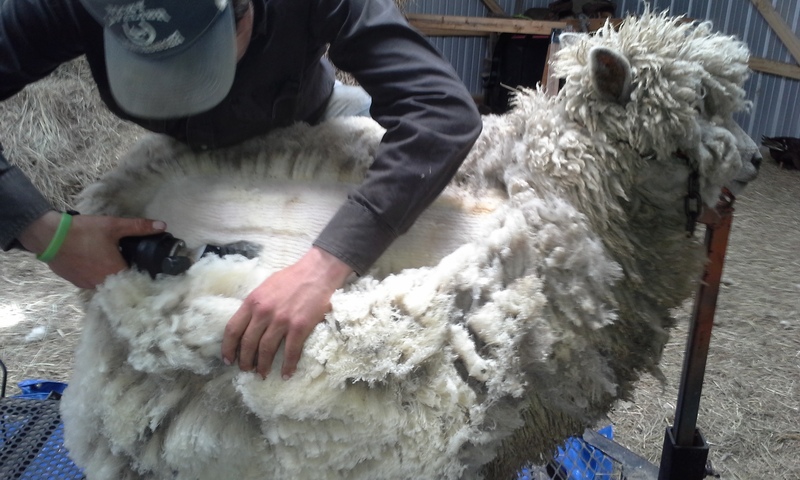 And shearing has even stopped as we had to send off all the blades and get them sharpened. So Pretty much all of Tuesday was us prepping for the Big storm. One of the things that is known about the prairie we live on is that it is part of Tornado Alley. And like everything around here there is a season for Tornadoes. And just to be clear … this storm was the start of Tornado Season. However, this time we were very lucky. We only got thunder and lightening with a ton of Rain and a bit of hail but nothing over pea size. As a matter of fact this time we didn’t even have repairs to do on any of the stalls. The only thing that did cause a bit of hubbub was that we had no power for quite a while. It went out at the start of the storms on Tuesday night and didn’t come back on until Wednesday afternoon. Mom is also starting up her Free Fiber Fridays for summer and she is going to have a LADIES NIGHT!!! Anyway, After the electric came back on it was to wet to do much of anything else so we got everything lined out for our summer schedule. The only thing Mom has left to do is set the date for Ladies night. She knows it will be a friday night but she thinks she wants it to be right before School starts back up but then she says it will be to hot so it is looking more like a June kind of thing … LOL She will figure it out. 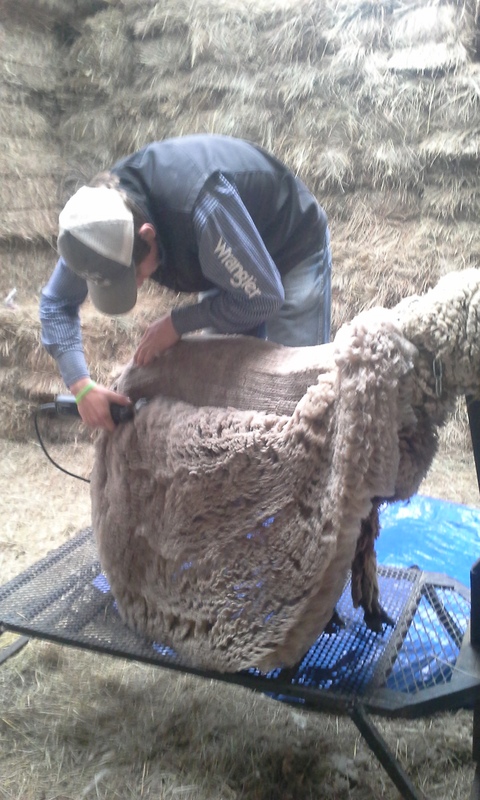 Anyway, Today after we got feed, I finally got to ride and we got our blade back so we did a bit of shearing as well. 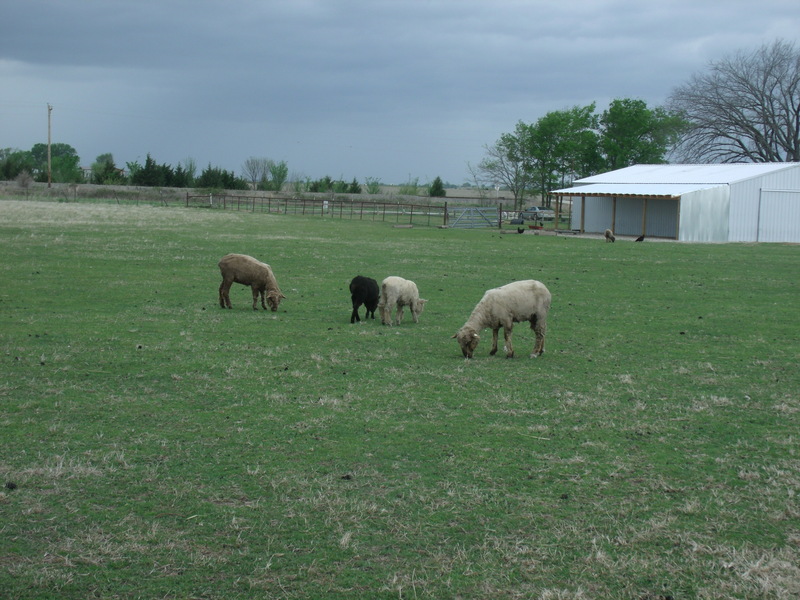 I think tomorrow we are going to try and do more then just our three head as Mom really wants every one sheared by May First … That was the plan but we didn’t count on the rain or our blade sharpener retiring … Oh well. I am sure we will be done soon. So My weekend started Thursday. While I did get a few things done around here, mostly it consisted of roping and rodeo. I did pretty good for the most part and even won a new belt buckle. So let me give you a run down of the days. Thursday Night I went with a friend to a two head roping at Supalpa but my times weren’t very good. I did catch and roped both calves but I just didn’t place. I had taken a bit of cold medication and I really do think that it made me Lag in my reaction times. Then Friday I did a lot of practicing. After Thursday night I wasn’t so happy with my runs so Practice is what I did. I even went to a friends house that evening and practiced some more. I made sure to take some time to fit in a few things Mom asked me to do … Like Till a small area she is going to use as a garden. 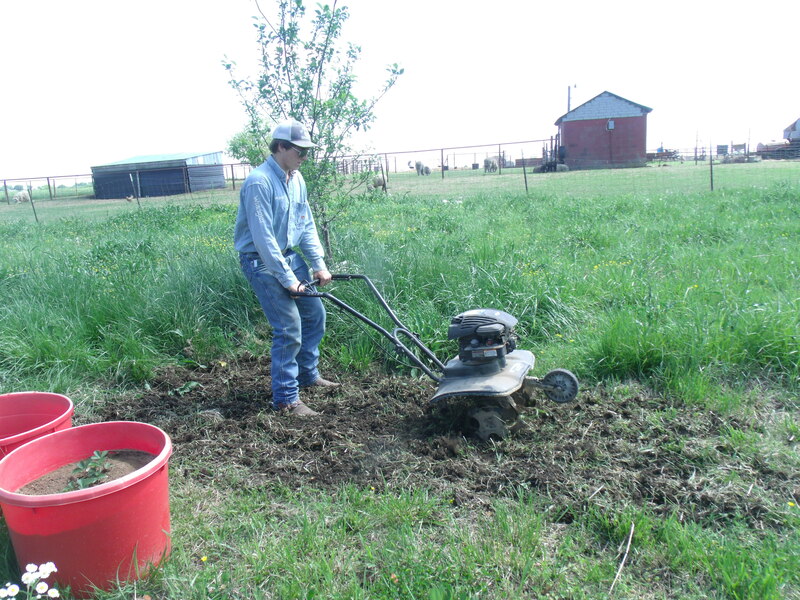 She wanted it tilled so that when the rain comes tomorrow I will be able to till it again and make a nice veggie bed. I started with her Tee-Pee that will have Peas planted on it this year. Then I moved on to the actual bed. This year Mom is going to have just a few tomatoes, beans and peppers. Saturday I was gone all day and made a roping and two rodeos. I started at the roping in Perkins where I won third place. From there I traveled south to Okemah to an open rodeo where I was a bit to long to win anything but I roped pretty good. Then once again I jumped in the truck and headed North To Turley. I was up in the slack after the actual rodeo and didn’t get done until 3am but I did end up winning 4th. After that I headed home and got to bed about 5am. 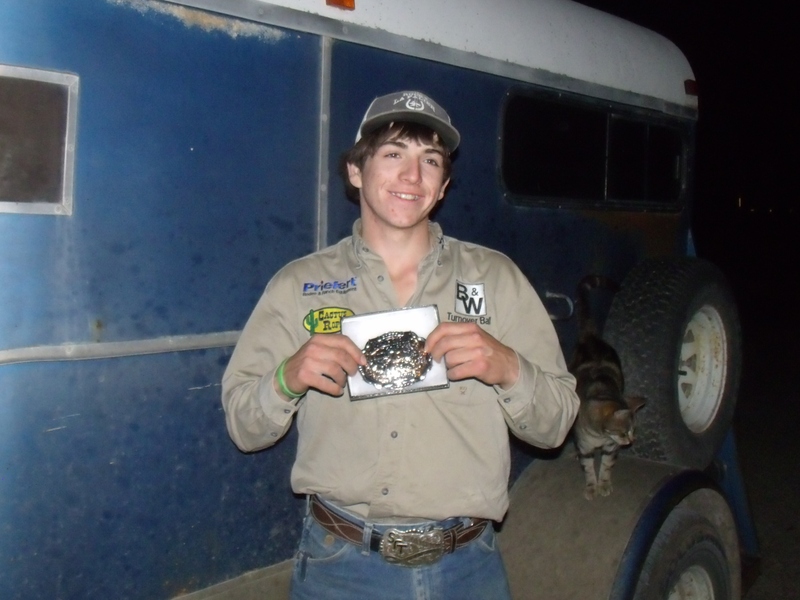 Sunday I was starting to get tired but I made one more roping where I won the Average and brought home a nice paycheck and a new belt buckle. Today I had to get Coop to the Vet for her yearly shots and coggin blood draw. When I got home I worked the horses and Mom helped me get some footage of Storm as she is getting to a point that I will have to make the decision to keep her or rehome her. For those that are new to the blog just so you know we don’t take rehoming a horse lightly. Last time it took us two years to find the Right home for Angel. We will see what God has planned for Tropical Storm in the future. As for now I have put her out there as available to an older gentleman if he is interested. We will see what happens. Yesterday, It was another rainy one. I have started coughing and getting a stuffy head and clogged up nose. Yup, I think I have a Spring cold. Mom has medicated me up so that means I didn’t do to much but be lazy. I did make sure all my chores got done and I checked all the cattle on the pasture. As for today Mom and I spent some time finalizing our Summer Program. We are calling it The Book Farm Summer Program. I know it isn’t very original but it works. Mom is working with the Coffeyville library and she will be supporting their program and they are going to spread the word and support our program. It will be geared towards kids Pre-K to third grade. Each Saturday in July from 10am to 11:30am We will have a story time with two books that have one animal in common. 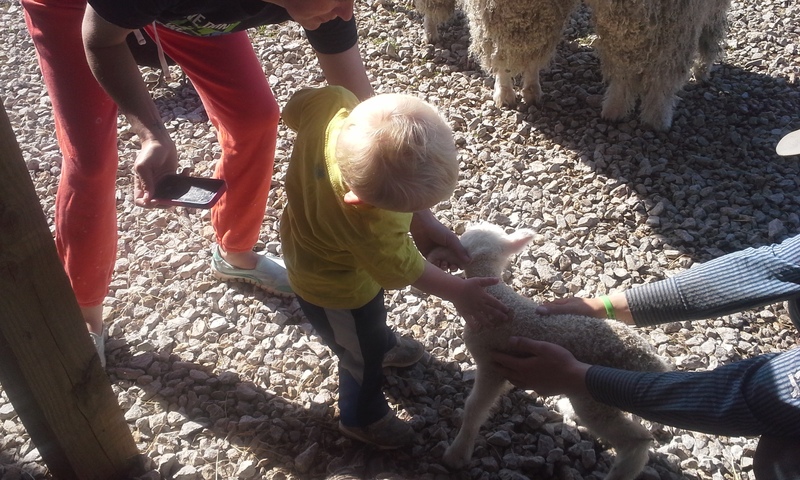 Then we will introduce real animals and let the kids get to know them. We will follow it up with providing a Make and Take craft that is also based on the animal of the week. Mom is doing the reading and the craft and I am in charge of the animals. Cindy at the Library has agreed to help Mom come up with two books each week and Mom plans on having the crafts be simple and all planned out ahead of time. After that I did fit in a bit of riding and I even roped a bit to practice for Thursday night’s roping. I then did chores and Mom gave me my medication again. It makes me drowse so I am heading to bed. Well, it rained some more. 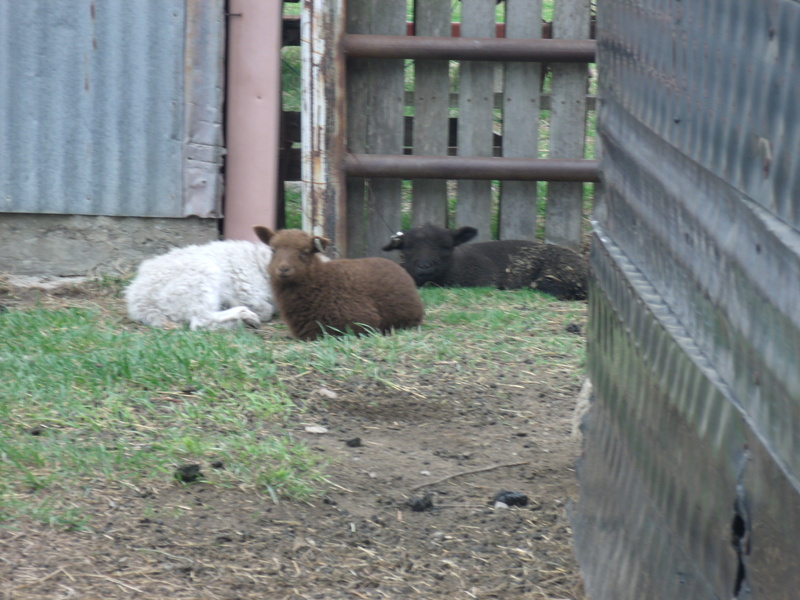 That means no shearing went on today. It also means that Mom and I had time to work on the drainage in the lots. On a break after lunch Mom went to check and see if we had made any improvement with all the rain and she found Coop in trouble. So with all the rain Mom and I worked on the drainage of the pens. When I was a kid, we called it playing water tamer and I always had a blast. I had no idea it was work or that we were keeping the pens draining properly. 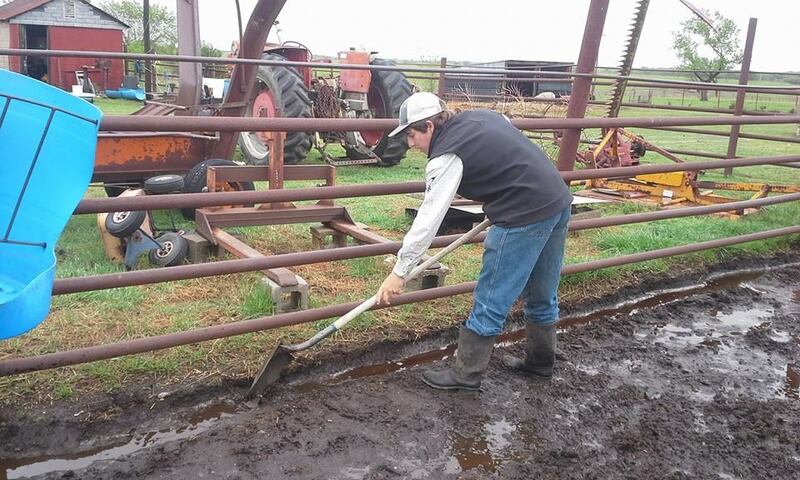 Since getting older it still looks like playing in the mud but it is actually keeping the small shallow ditches that Mom created along the fence lines clear and draining extra water away from the pens. After a bit Mom and I went into work on the Taxes as Dad had a Doctor’s Appointment. We also took time to eat lunch. 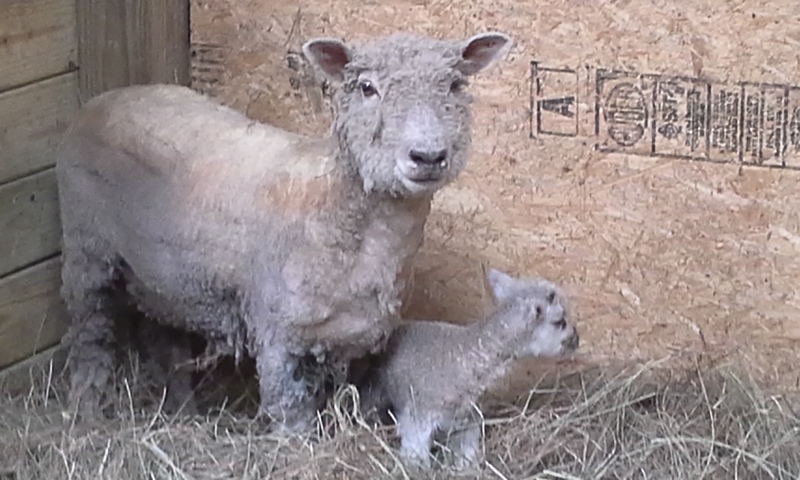 When Mom came back out she heard a banging sound coming from the barn and found Coop acting as if she was in pain. Her tail was up, she was sweaty, she had pawed a depression in the center of her stall and you could see the veins and muscles on her belly tightening up. All are signs of Pain and Colic. We got Coop haltered and since Dad had just gotten home, he started walking her. Mom sent me for a shot of Banamine. Then she got Doc on the phone. Doc said we were doing everything just fine and to keep walking her until she had a bowel movement and the medication took hold. He also said we could drench her with some mineral oil but at the time I couldn’t find the mineral oil so Dad just kept Coop moving. With in about 45 minutes she passed a bit of bowel. Not really the normal amount but enough that we put her in her stall. Her tail was relaxed by then as well and she was no longer sweating. Her stomach muscles also seemed to be relaxing and that was a good sign too. We spend the rest of the day keeping watch over Coop and Rodeo. Rodeo is the Goat that came in earlier this week. He still has scours and so for the next 24 hours he will be on mineral water. I know it sounds bad but one thing that we have learned is that giving an animal milk when they are scouring is like throwing gas on a fire. It make the issue worse. So at 10am tomorrow Rodeo will get his last vitamin bottle and at 4pm he will get a milk bottle … with a little of God’s Grace it will straighten out his bowels and tummy and he will get on track to go home. So today we all were dragging. I did get in from my Rodeo until about 4am this morning. With chores to do that means no sleep until about 5. It did seem to slow us down a bit. 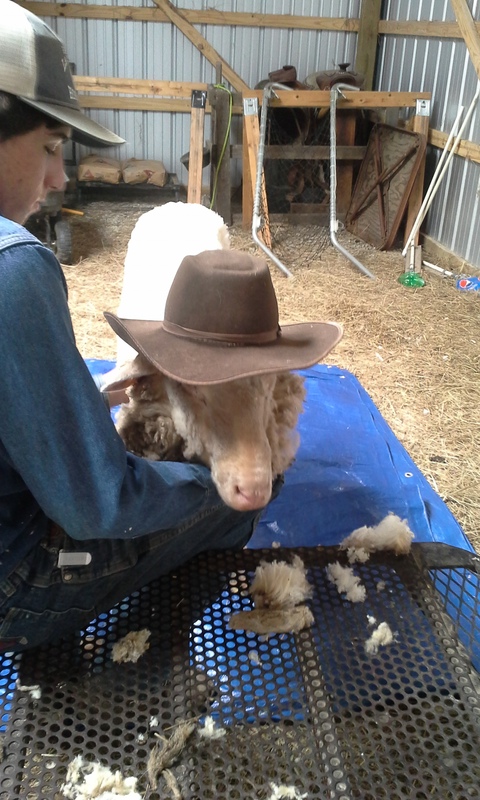 We still did our shearing and I did some roping. We also took time to use the Rain and have Dad’s Dad out for a bit of cards, coffee, brownies and dinner. So yesterday was great and stressful all at once … LOL We had 2 scheduled Farm visits. Both were great and I had fun. 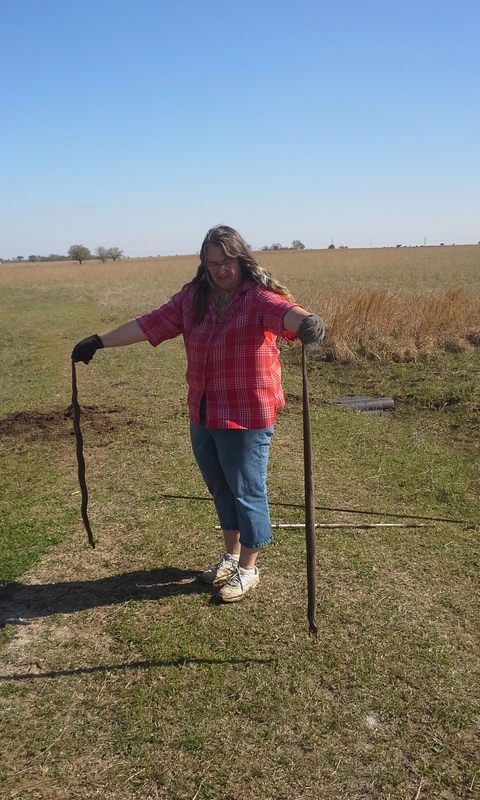 After that the stress came into play when I was gathering Cattle and horses to rope and found two LARGE water Moccasins at the pond. I didn’t get to rope as much as I wanted but the farm has two less snakes on it and I didn’t even scream like a girl and run away like I normally do … LOL … yes to some readers they might say I am really growing up. Truth is I rode away on Storm as fast as her little legs could carry us … LOL. Yesterday started off pretty good. My buddy came to see his goat. He came during the morning feeding so that he could care for him and learn to take care of him. While My buddy and I did a short farm visit, his Mom talked to Mom about all the things she would need to know about taking care of Rodeo. (Yup Bub finally got a real name) She learned what he would need for housing, why a Billy is no pet for a two year old and even took note of toys that she could make very easily for him to keep him entertained. They also talked about fencing for his pen as he was able to get out of the dog kennel they had him in the night they got him. All in all They are learning and in the mean time Rodeo is doing will although he had to have a bit of Pepto again tonight but I do think it is more the difference in Milk replacer then anything else. We are keeping a very close eye on it and when he gets to Raisin Poop as we call it he should be in the clear to go home. That is if the pen and shelter is ready. When Mom text them to see how it was going it was funny but not really as the housing didn’t hold together. I am sure they will try again. 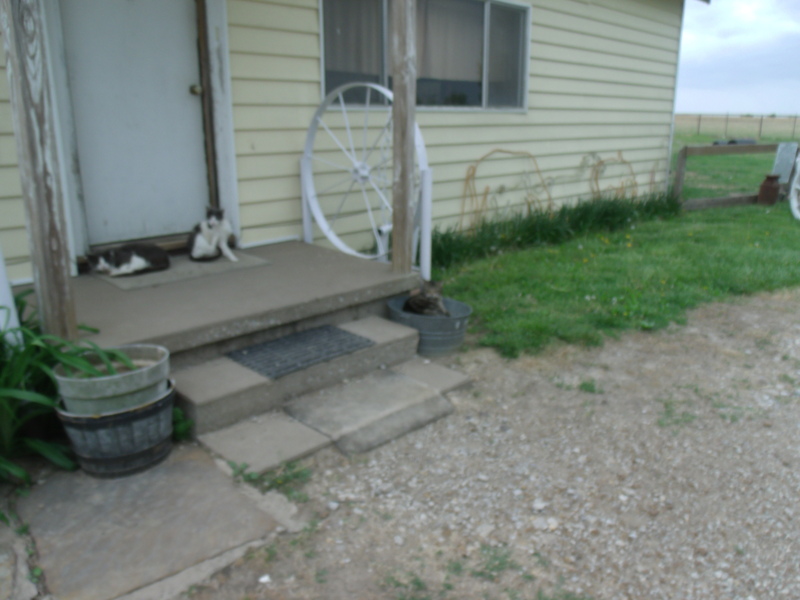 Then Mom had a friend over to do a farm visit but she is getting to be a regular. Jane and Mom swapped fiber and did some business before going out to experience a real farm Visit. You see Jane is a friend of Mom’s so she never really gets the full visitor farm visits. It is one of the things that people said was so different at our event but Jane didn’t really understand. She knew that her animals came when called but she had never seen the full magnitude of 32 head all running from all four corners of the pasture just to get cookies. LOL This time Mom made sure she experience the whole experience of the farm and I think she really enjoyed it. So did her Son. As Mom and Jane ate lunch I decided it was time to rope so I went to the pasture to gather the horses and cattle. That is when things changed. 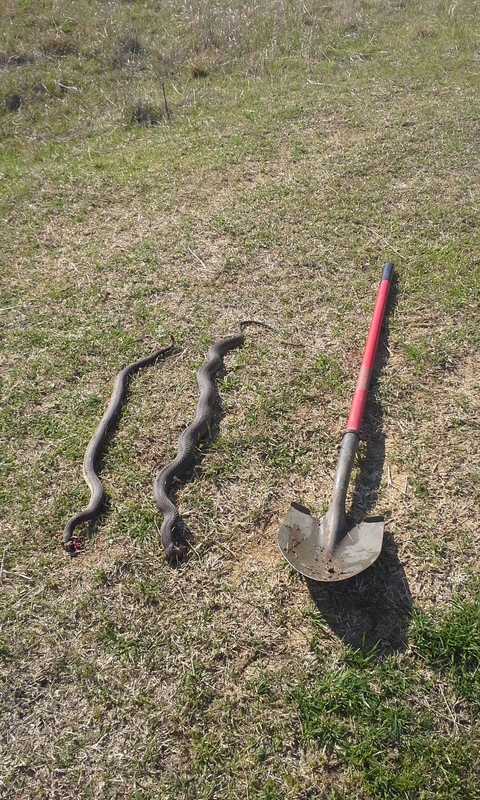 As I got to the pond I found two water moccasins sunning themselves. I headed back to the house to get a gun to shoot them. When I got back to the pond with the gun I guess I spooked them as they disappeared into the drainage culvert. That is when I called Mom and got some help. She came down and after a few attempts and strategies we finally got both of them. When we got done and ate lunch Mom and her buddy were going to gather eggs and I was going to rope. 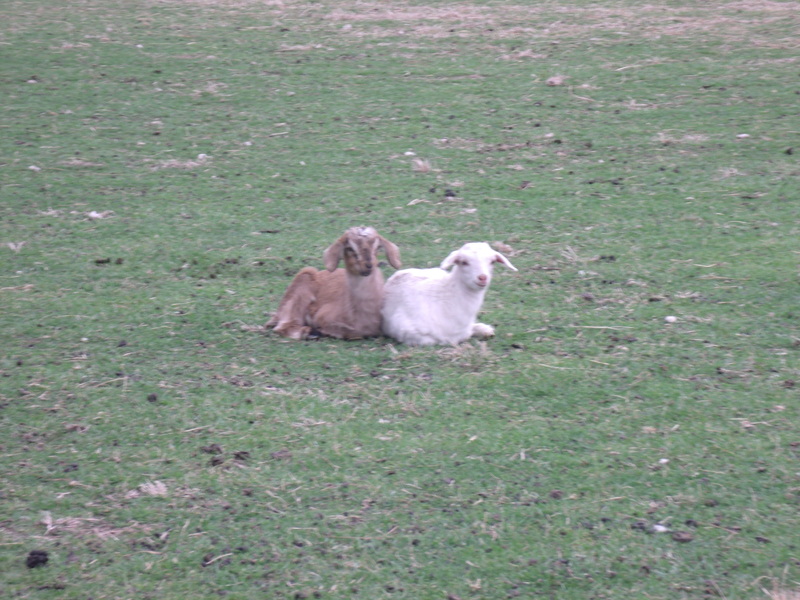 That is when I found an unexpected surprise on the pasture. It seems that Aurora Played with Burl when he escaped too. Mom is a bit upset but what are you going to do. Mom’s Buddy helped get the baby to the barn and set up in a stall and then he baby sat while Mom and I got Aurora in the barn to join her. Since her Buddy helped and babysat we asked him what kind of tree he wanted to call her. First, he said Banana but then he said she wasn’t yellow so he would call her Apple. 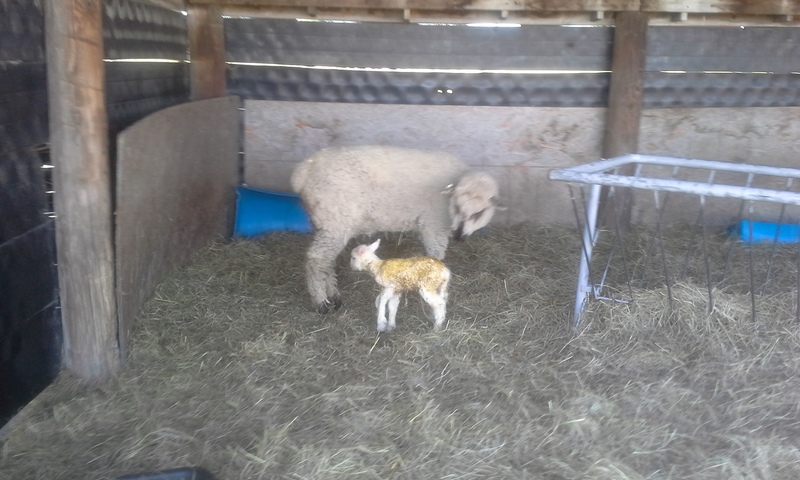 So I give you Apple the 1/4 Cotswold, 1/4 Southdown Babydoll and 1/2 SHETLAND. I know, I know, That fiber might just be all messed up but I guess we are going to have to wait and see. So Tuesday was a very productive day. Mom and I started out by picking up the feed we ordered that didn’t get done until that morning. On the way home we stopped at Doc’s and got some more medications. 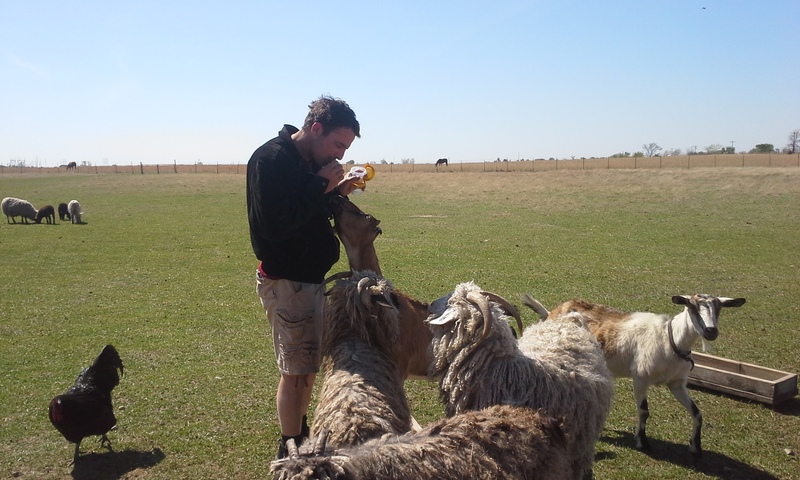 Then we sheared four sheep and had a wife and husband stop by to look at the goats. Then Patch gave birth and we got a late night call about a baby goat needing some care. Then today was just as busy. After we picked up feed yesterday we went by Doc’s office. We talked to him about the extra treatments we gave the calf just because we didn’t know what was going on. He told us we had done fine and even gave us some different meds to give the calf if anything like that ever happens again. He did tell us that if it does happen again it is more then likely an ulcer but we will cross that bridge if we get to it. 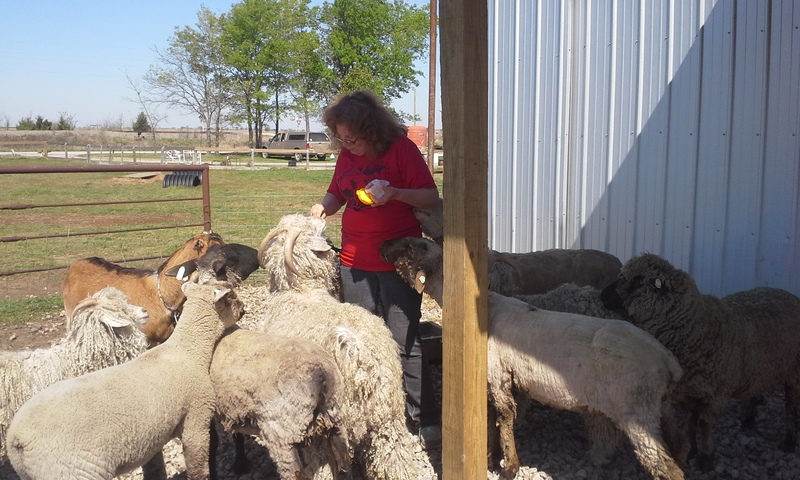 With the feed in the truck, Mom and I left it in the pasture by the barn and got right to the shearing. 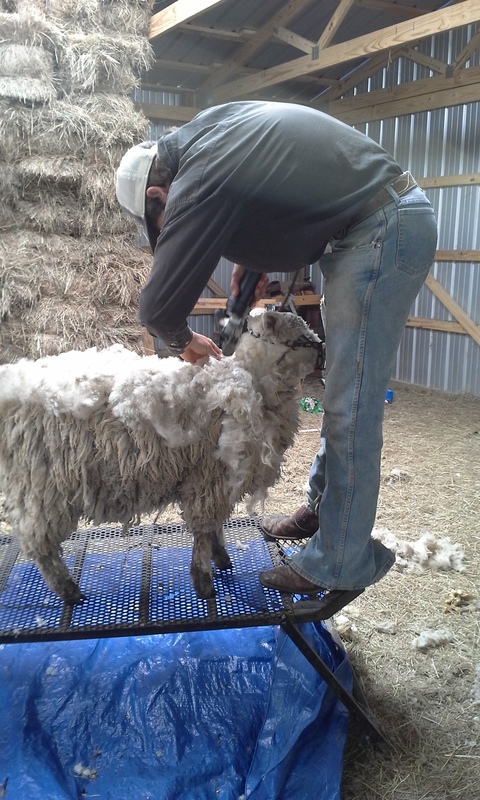 We tried to get a little bit caught back up since we didn’t get any shearing done Monday due to my Dentist appointment. 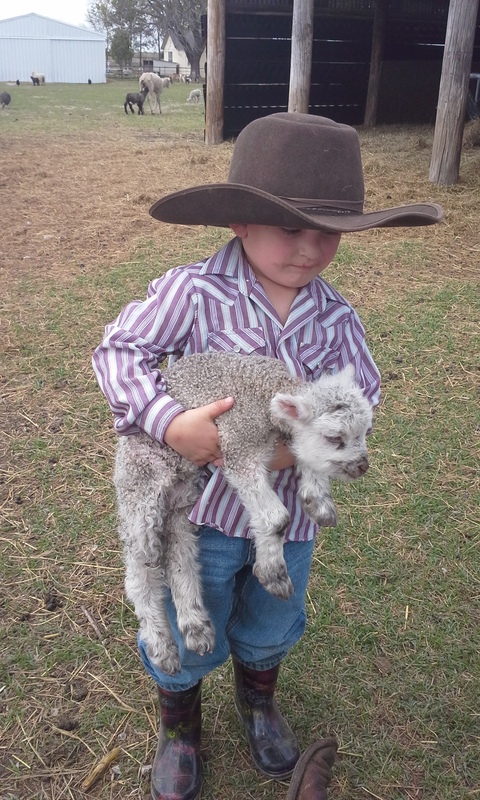 We ended up shearing 4 QT cross sheep. 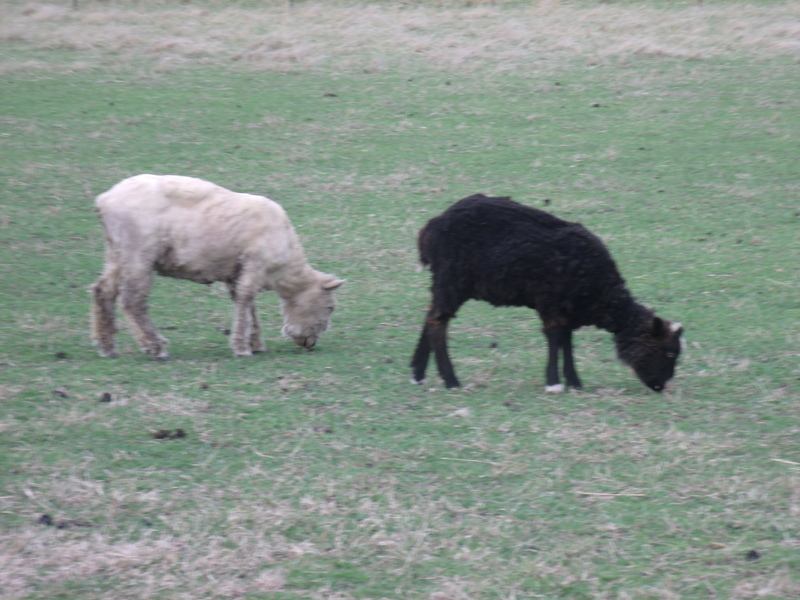 It is pretty odd how different their fleeces are. One was more like Cotswold and yet another was more downy like the South-down. 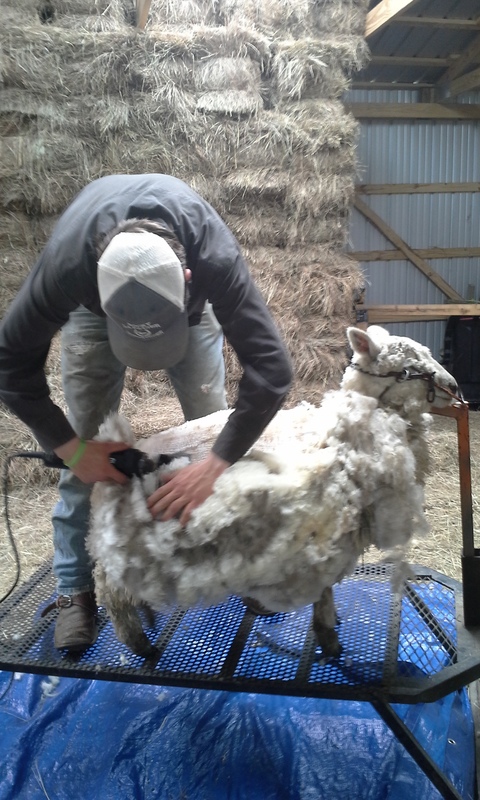 All in all it went well and we got the days shearing done. As we were getting the last sheep almost done a couple came to look over the goats. 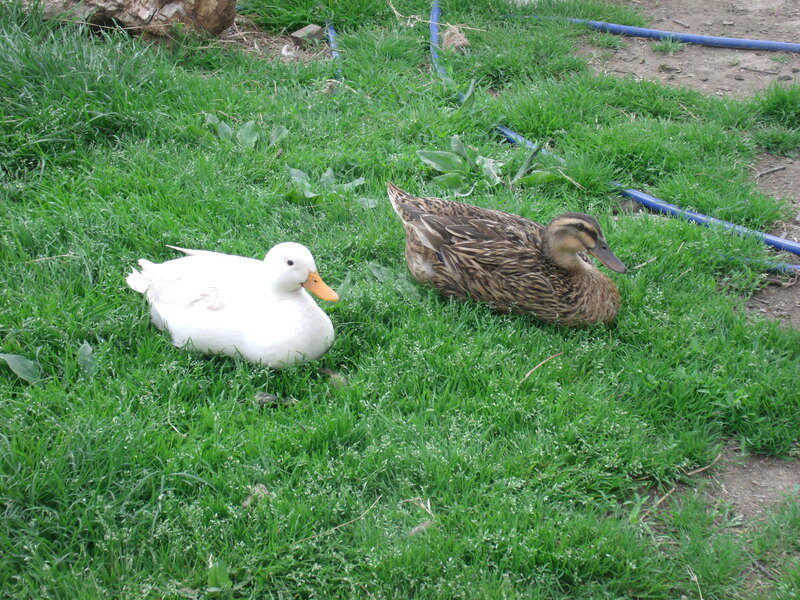 They want to get two of them as lawn mowers around their place. 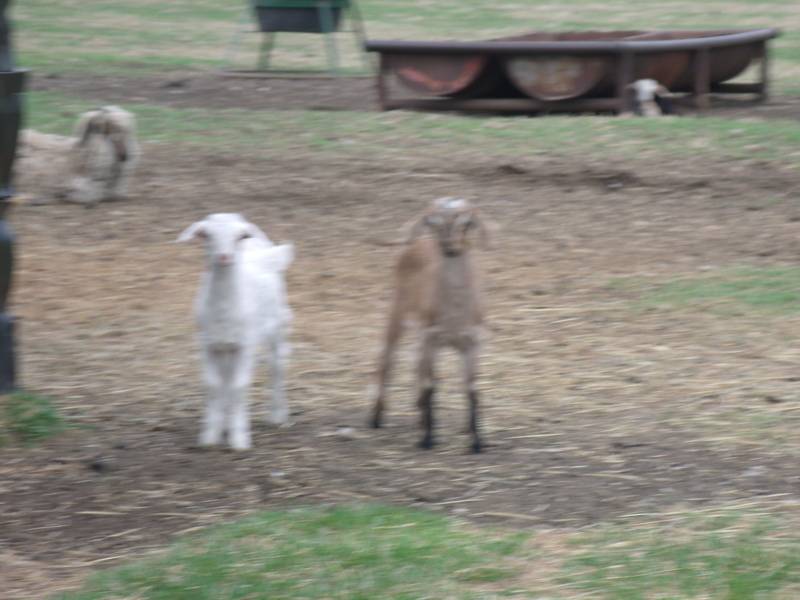 They won’t be taking them until weaning age so that they can get fencing up in the area they want the goats to be. Mom really likes the idea of them going to be pets and not ending up in a market place somewhere. After they left I found Patch under the pasture stall with a little surprise. 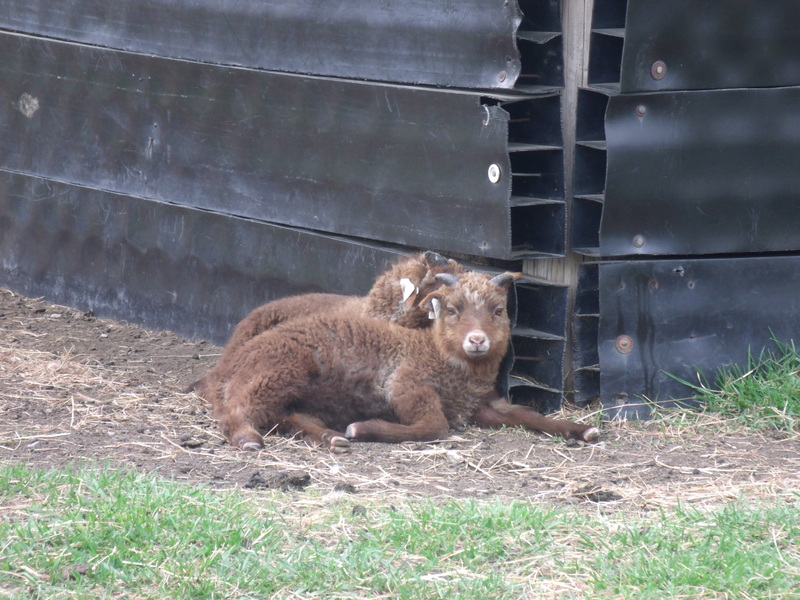 After Mom’s buddy did his homework, he took time to set up Patch and Pear with a nice bed in the stall for the night. He then fed and watered Patch as well. He did a great job of taking care of Momma and her baby. While he did that I went to the arena to fit in a bit of Roping like normal. The calf that had it’s issues the night before was acting as if nothing happened. I found it odd but if she is doing well I will not worry about it at all. When I got done I moved right on into chores and was planning to get to bed a bit early. 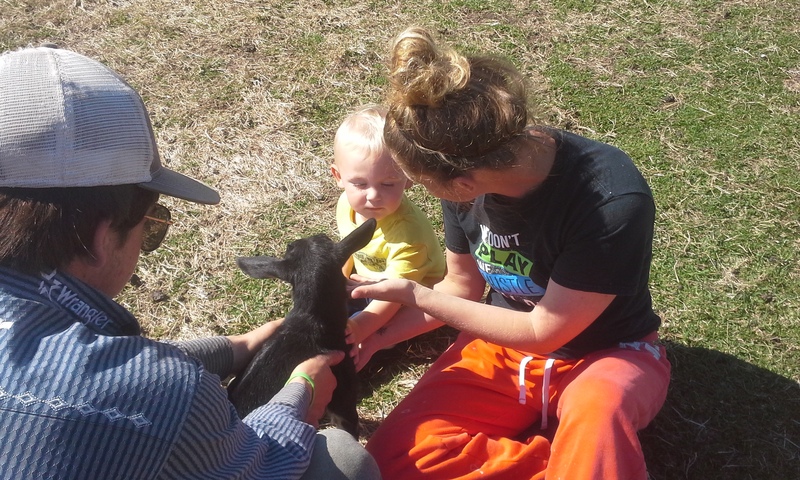 That is when I got a phone call about a goat that was purchased at a local sale and given to a little buddy of mine. You see my Buddy is only like 2 years old and he has no idea how to care for a baby goat that is so young it still has it’s umbilical cord. And to tell the truth neither do his parents. Since it was a gift they really didn’t want anything to happen to it so they called me. Mom and I talked about it and decided we would take it in until we can get it to a three times a day feeding. It should only be here for a few weeks but at least this way we know it is started right. Then when it is a bit older and they can feed it morning, noon and night then my buddy can move it back to his house and he can help feed it. 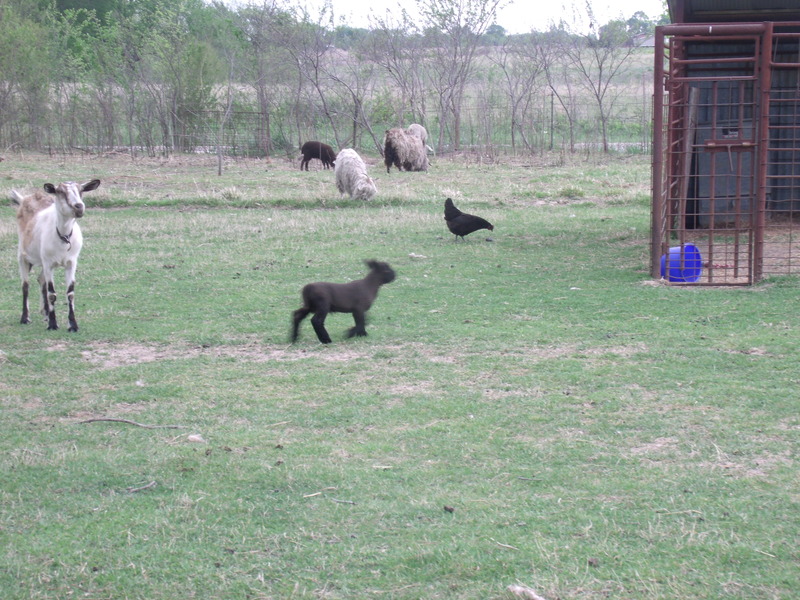 That also gives them time to get a goat proof pen ready for the little one. For now Bub as we are calling him is on an every 6 hour feeding schedule. 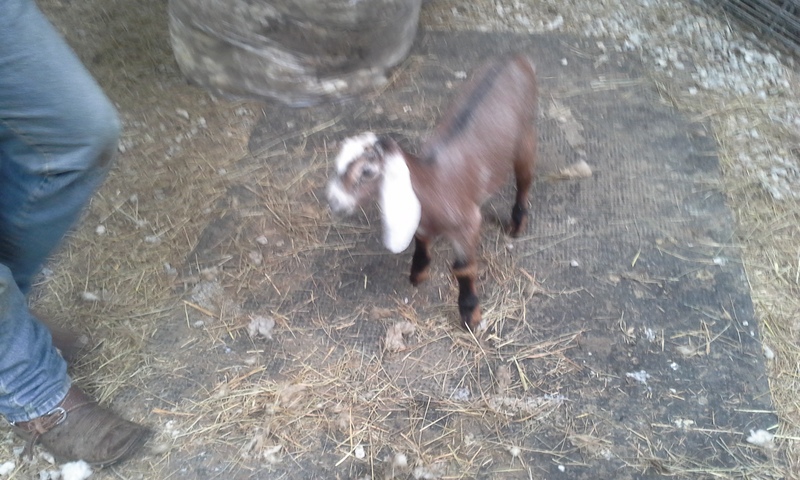 After last night’s late night getting the goat all settled in, this morning I was up at 4am for Bub’s feeding. He is doing well but seems to have a bit of an upset tummy by this evening because of the milk replacer switch. We should be able to get him lined out in no time though. After chores Mom took me to town to get my Coggin’s papers on Coop turned in for the horse show. 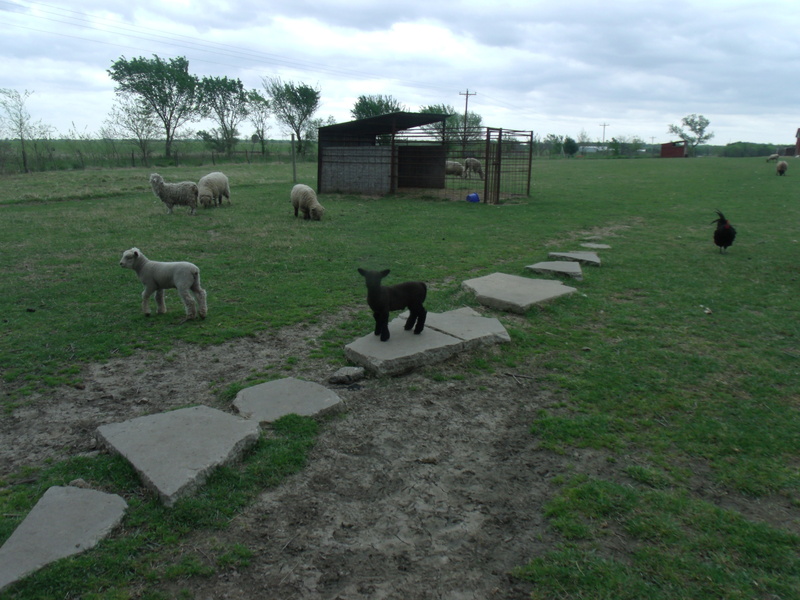 Then we came home and got back to shearing. 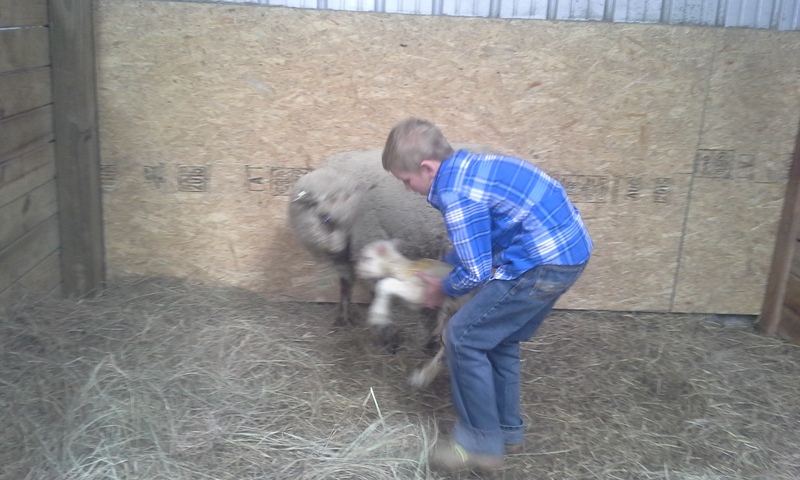 We did two more Ewes today. Big Momma and Baby Girl is who I got caught so they were up next. 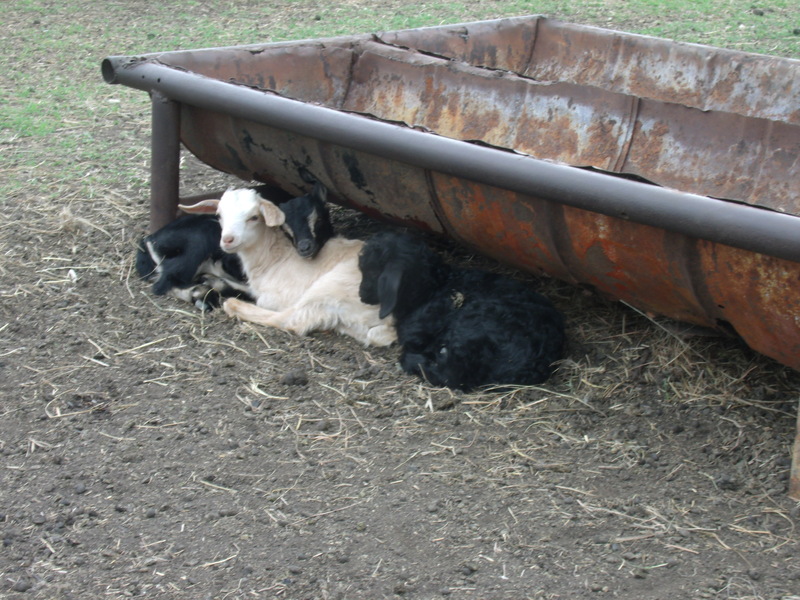 I will say this … I am getting much better at taking off the blankets of the sheep. Check this picture out that Mom got. After we finished that up I helped Mom get the tags and leg and under belly wool taken to the garden. 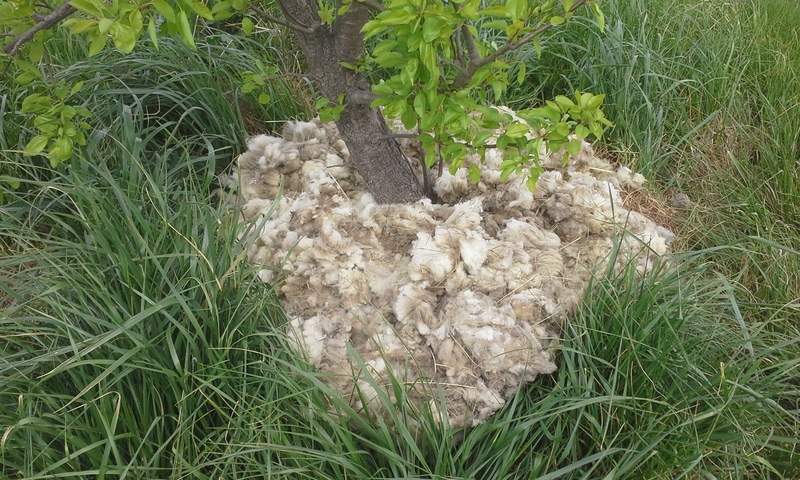 Every year at shearing time Mom puts the “yucky” wool around the trees in the orchard. 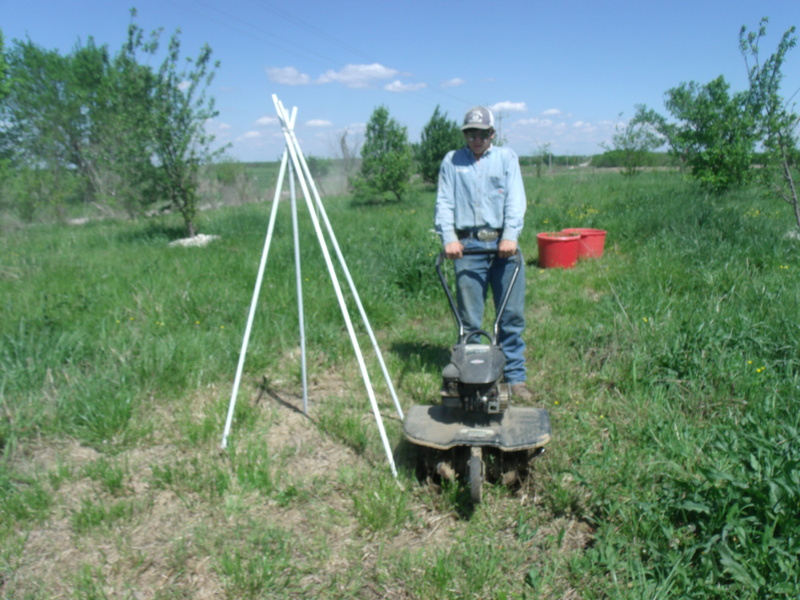 She says it helps hold the moisture in and keep the weeds down. All I did was help get the wool in the poly cart to the trees. Mom did the rest. After that I was free to rope while Mom took on Bub’s afternoon feeding and let him out to play while she cleaned the barn. I ended my day with chores and some dinner and here in a bit I will be heading out for Bub’s 10pm feeding. Then I am off to bed.